← Who Is The Master Who Makes The Grassy Knoll Green? The times they were a changin’ back in ‘64. JFK had just been takin’ out and shortly after The Beatles emerged on the landscape to breathe a little positive vibe into the National Downer that’d just gone down the rabbit hole. Against this backdrop, Greg Hill and Kerry Thornley entered into perhaps their most productive collaborative period, sowing the seeds of what would become the 1st edition of Principia Discordia: Or How The West Was Lost. Back in ‘61, Thornley and Hill moved to New Orleans where they engaged in a number of early Discordian activities, some of which were covertly copied on New Orleans D.A. Jim Garrison’s mimeograph machine by a friend who worked in the D.A.’s office, Lane Caplinger, who just happened to be the sister of Grace Caplinger, later to become known to the world as actress Grace Zabriskie, none other than Laura Palmer’s mother among other notable roles. Garrison, of course, would play a larger and much weirder role in Thornley’s consciousness in the years to come, to be covered in greater depth in my forthcoming book, Caught In The Crossfire: Kerry Thornley, Oswald and Garrison’s JFK Investigation, coming later this year from Feral House. 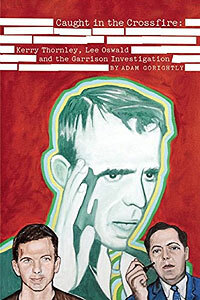 In ’63 — after JFK’s assassination — Kerry moved from New Orleans to Arlington, Virginia for a number of reasons, one of which included being in closer proximity to D.C. where the Warren Commission had recently convened, and Kerry — looking for an angle to promote his novel in the works, The Idle Warriors (the main character of which was modeled on Oswald before the Kennedy assassination) — was hoping to wrangle an appearance before the Commission. The rest, as we know, is a weird slice of history. The documents I’ve posted here would — in the following year, 1965 — greatly influence the 1st edition of the PD, which will soon appear in its entirely for the first time in 50 “odd” years in our forthcoming book project Historia Discordia: The Origins of the Discordian Society, coming soon from RVP Publishers. In these early years, Hill and Thornley spent an inordinate amount of time developing a Discordian Society hierarchical structure that would eventually dissolve into nothingness when Greg Hill later decided to forgo any type of formal Discordian structure and turn the whole thing into an art collage project without rules and regulations, which led to a more free form approach to later editions of the Principia Discordia. Some items to note include Kerry’s (Omar’s) mention that he sent a copy of “Why We Think The DS Is A Hot Item” to Grace Caplinger (Zabriskie), as well as what is perhaps the first formal mention of the fabled Law Of Fives, a document lovingly adorned with a slew of Greg Hill stamps, as he was wont to do. Discordian Documents: Why We Think The DS Is A Hot Item, dated April 1, 1964. Courtesy of the Discordian Archives. Discordian Documents: Disorder Table for the Discordian Society, dated April 9, 1964. Courtesy of the Discordian Archives. Discordian Documents: Disorder Table for the Discordian Society, dated April 12, 1964. Courtesy of the Discordian Archives. 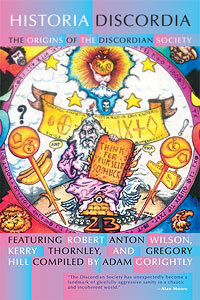 Discordian Documents: Official Discordian Esoteric Hymn Number Three, dated April 20, 1964. Courtesy of the Discordian Archives. Discordian Documents: On The Law Of Fives, dated May 5, 1965. Courtesy of the Discordian Archives. This entry was posted in book, discordian timeline, discordianism, greg hill, jfk, jim garrison, kerry thornley, lane caplinger, lee harvey oswald, warren commission. Bookmark the permalink.